Small Adventures Taleisin - Adventure Machine! When you own an adventure machine like Taleisin, there’s no shortage of adventures. After our little adventure with Taleisin in Bon Accord Harbor we talked about the situation and what could have been done better. Sure, we didn’t break anything and nobody got injured, but that doesn’t mean that we were comfortably in control. We discussed it with Lin, and she shed some light on what may have happened. Lin suggested that we take her little 12.5’ boat out for a sail and go and learn what the winds do when you get closer to the headlands. While waiting for a bit more suitable weather as the wind was blowing quite a bit and it was really gusty too! We just kicked back and relaxed. We did have a day where we went walking on the other side of North Cove. It truly is a magical island. It’s not in any way related to the timeline we’re used to. It really feels like time has moved on and this little island is stuck in the past. We absolutely love this place! Yesterday the winds was a bit more favourable and Lin took us out for a few minutes in Felicity. She showed us the ropes so to speak and then we headed back to the dock. Lin sent us off on our way and we spent the better part of a few hours out there tacking back and forth into the wind. We gybed all the way around to see how that would affect things and we got close the headlands to see how the winds shifted. Doing this is a small boat is a lot less intimidating since running aground means that you can hop out (she only draws 3 feet) and push her off. Fending is also a lot easier as she weighs a lot less than Taleisin. It was a great learning experience and it really showed us how the winds can bend around headlands. Experimenting is easy since the boat responds really quickly. When the situation changes the small boat lets you know almost instantly. All of this is good and well, but was it fun? Heck yeah! If you haven’t sailed a little boat I highly recommend it. You’re a lot closer to the water, the boat responds very quickly and everything is very manageable. While there’s winches on the boat, we didn’t have to use them since it was so easy to just handle everything by hand. I’m sure if the winds were blowing much harder it may have become required, but it would have had to be blowing a LOT harder. After we had our fill and the winds were picking up to a level where we would no longer be having fun we decided to return to the dock. Since we were approaching with the wind behind us we dropped the little main before we got to the dock and sailed under jib only. We tried to glide into the dock as smoothly as possible and let the jib fly before we got there and hopefully the way would just carry us in. It didn’t quite work out as planned, but this was our first attempt. We came in a little hot, but since the boat is so small and light I could just grab the dock and bring her to a stop. This is not something I would have been able to do in Taleisin. We put Felicity away and closed her up and returned to Taleisin. 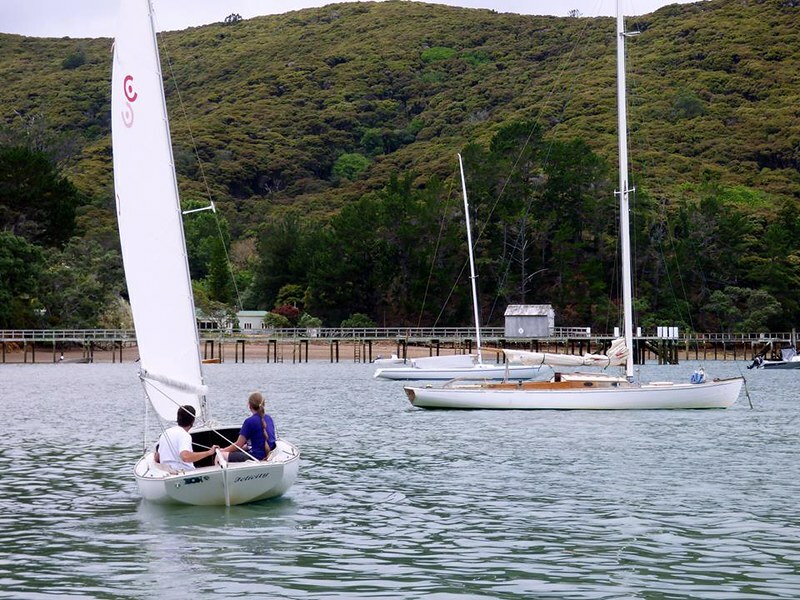 This morning we decided to sail to the Mahurangi river for a slightly larger adventure. It might not be the smartest direction to sail in as we had the wind on the nose the entire time. Armed with the new knowledge about winds and headlands we were well prepared for sailing between the islands to our destination. We could tell when the winds were shifting and how they were shifting. We did a lot of tacking back and forth and had some challenges along the way. Nothing we couldn’t handle now that we better understood how the winds react. 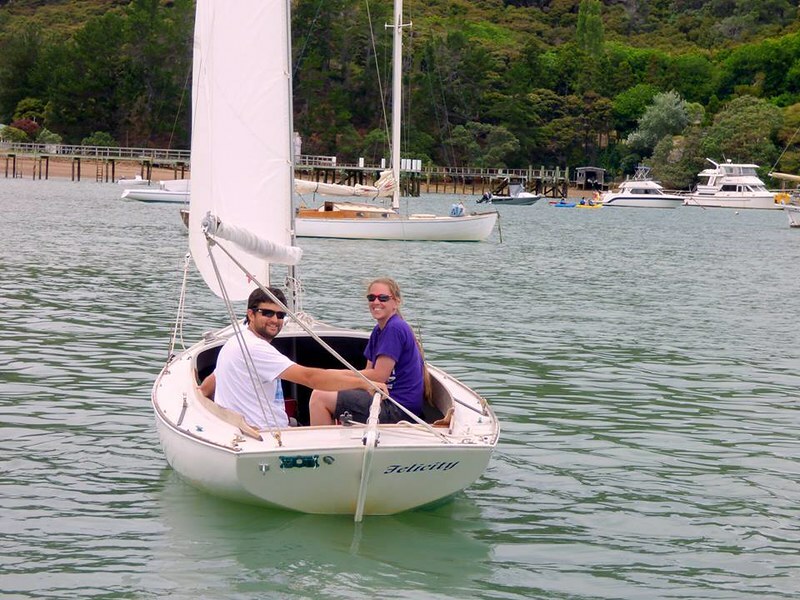 We sailed into the river mouth through all the islands and figured out how to get in safely. While we could have sailed up the river, we thought that since this is our first attempt at it we’ll play is safe and use the outboard motor to get us to our anchorage. We kept observing the winds as we motored and talked about how we could have sailed it. While this was less exciting it was still worth while as I’m sure we’re learning from it. Once we found the spot we wanted to anchor in I dropped the anchor as Annie turned Taleisin around to face into the wind and set the anchor at the same time. Anchoring is getting easier and less daunting. I guess I’ve read too many books and stories about anchoring gone wrong. It would appear that if the holding is good, it’s just a case of getting enough chain out and allowing enough room for the anchor to set. 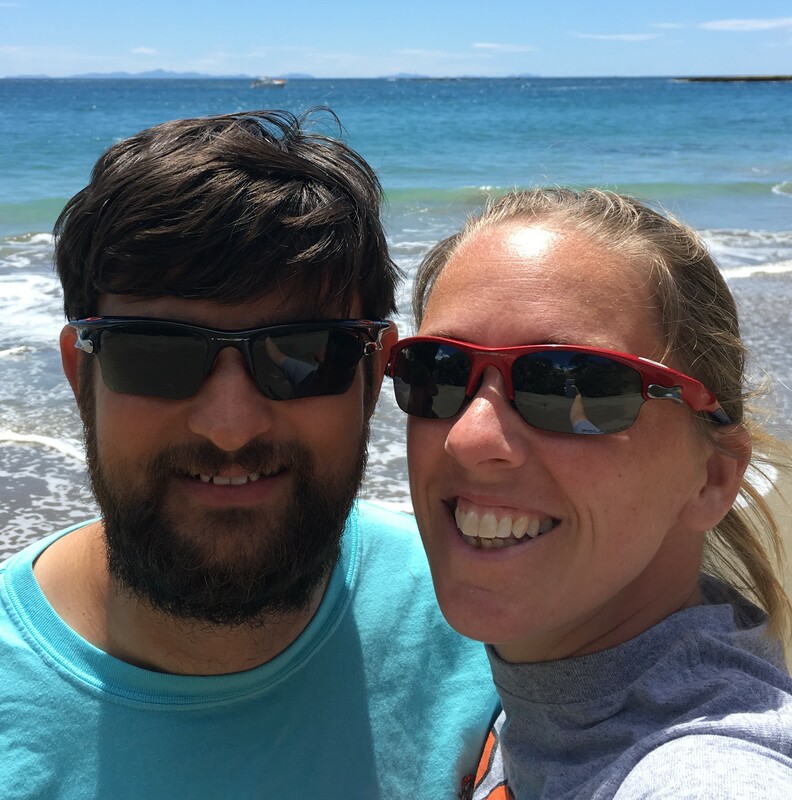 Whilst the adventure is not as exhilarating as some of the previous ones, it’s still fun and the challenges are just enough to keep us on our toes. Hopefully we can keep building skill and confidence as we continue to cruise this wonderful little boat. As an added bonus we got a special treat tonight. We watched the sun set in the West and minutes later we watched the moon rise in the east. 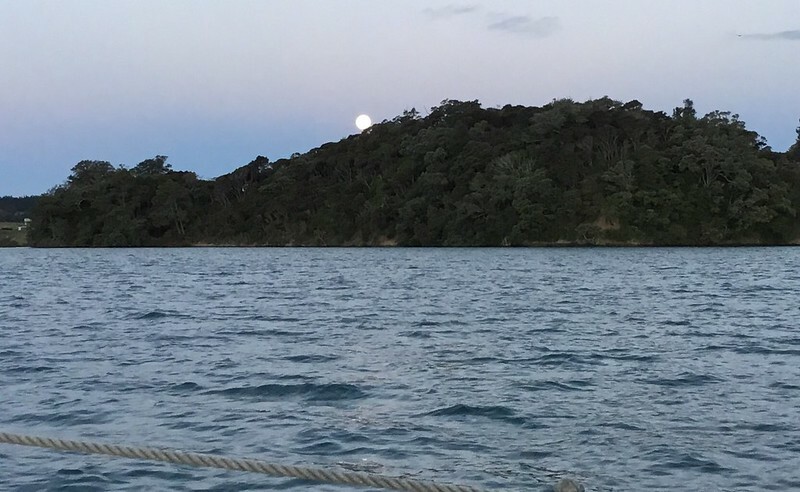 Tonight is full moon, it’s quite spectacular being out on the water.